A long time ago in a place not far away…there was no internet. 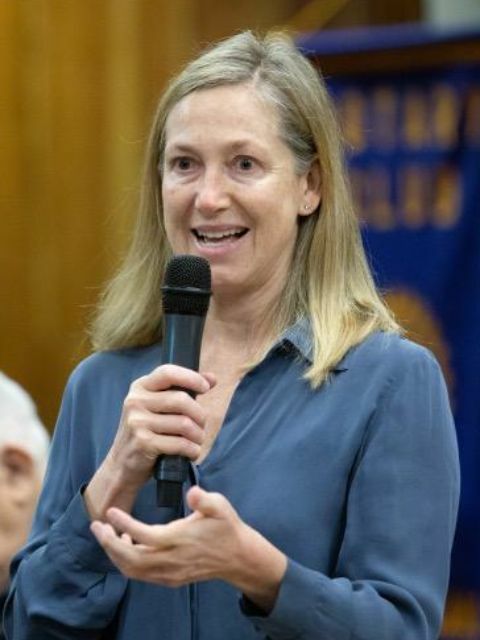 News from Rotary spread by word-of-mouth. It was archaic and inefficient, but it worked. 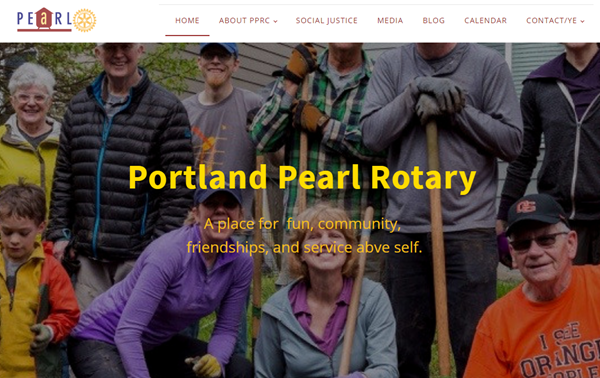 Shortly after we moved to the Pearl and changed our name to match our new home, we embarked on a bold journey to modernize our outreach by building a new website, complete with pictures, blog posts and a calendar. Members were indeed awestruck. 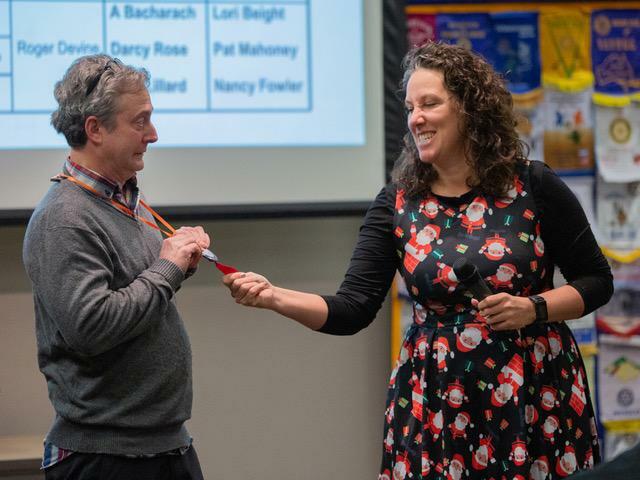 About the same time, an intriguing man with a printing press tattooed on his chest came to us and said, “Behold, I will create for you an award-winning monthly newsletter.” And, thus, was the PPRC newsletter born. It was brilliant, daring and when printed, quite heavy. Meanwhile, advances in social media software and technology rendered our old website obsolete. It became the old farmhouse surrounded by luxury high rises. People (yes, you) are plugged into the internet. You’re doing it right now. A modernization of our website and our approach to communication was in order, and that meant rebuilding our website to be a communication hub. We created a simple design, built the site using off-the-shelf tools, and designed it for easy growth. For example, each committee can have its own web page, own event calendar and own blog posts. It’s pretty slick. 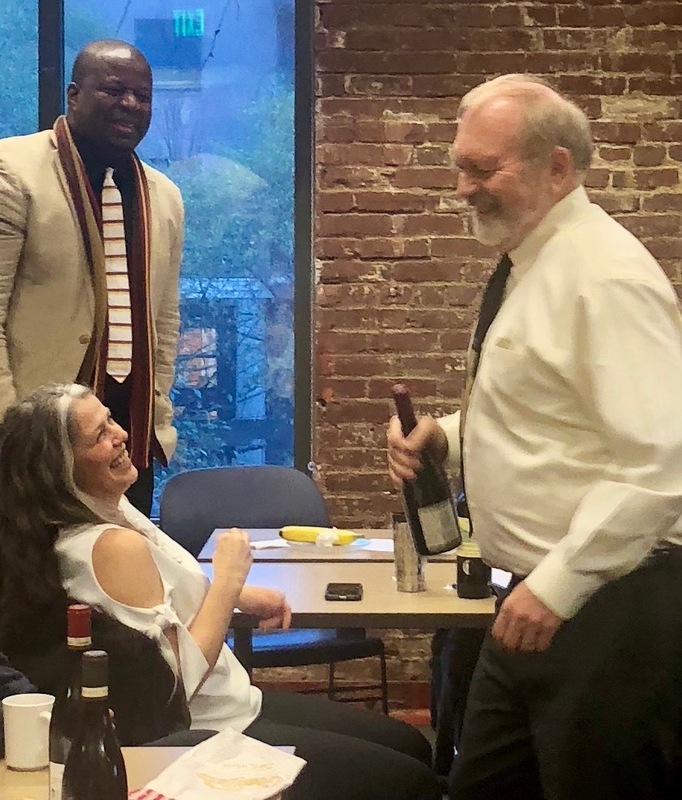 It has been an honor to be a part of our communications committee of PPRC for the past six years, under the guidance and leadership of Don Smith. The committee and I will move forward into this new era, with a new website and new avenues with social media. This is what I can tell you for sure. 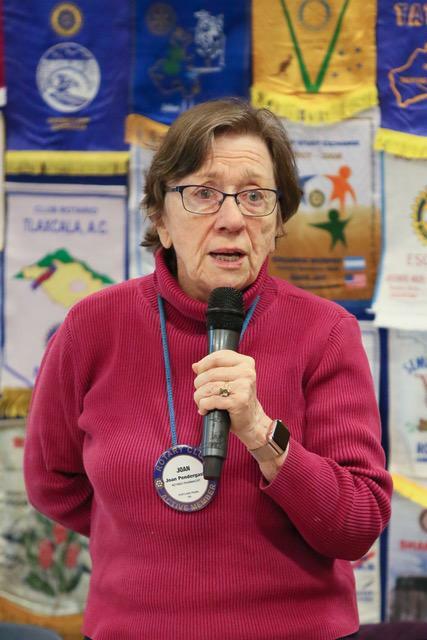 • All of the information and stories that you as a member enjoy about our club, our projects and fellow members will continue to be highlighted and accessible. • We will still have a newsletter, but the stories and information will drive you to our new website for further reading and information. • Our website will truly become a hub of all things PPRC. As we build out the website, each committee will have its own page. The calendar of events will be current with all club, district and community events. • We will continue to have a robust presence on Facebook. We are also growing into Instagram and LinkedIn. Please like us there as we are building PPRC content that is appropriate for those outlets. • Expanded internal membership profile information for fellow members. • Additional marketing pieces that we can use when presenting in other Rotary or public functions. I look forward to serving as your communication chair for this club in the coming year. 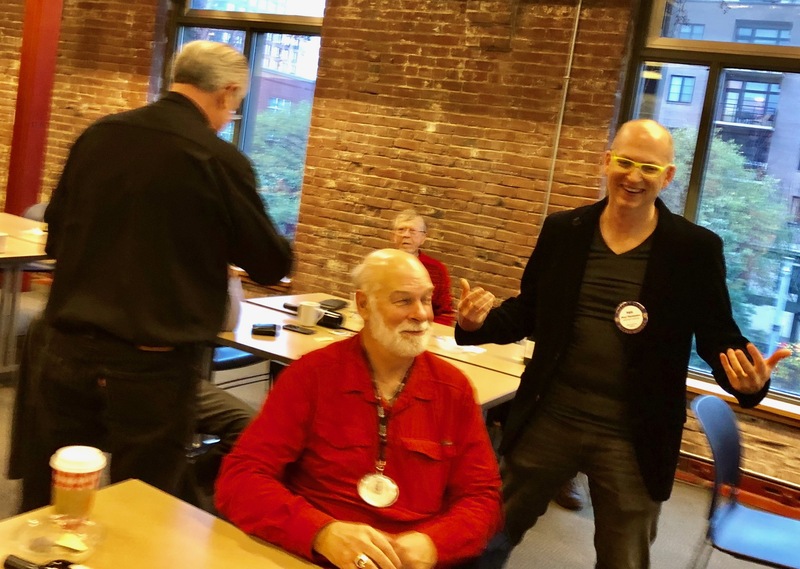 Your Portland Pearl Rotary's communications committee has reached a milestone and has made a transition. Volunteers Sid Smith and Tara Mussulman have shared their observations (above) about the unveiling of our rebuilt and expansive website. Reaching this moment has been on the committee goals for two years and maybe more. We went "live" about a month ago. 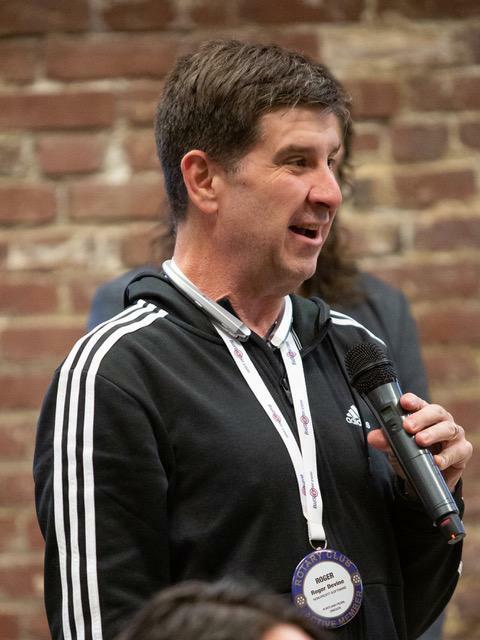 The "work in progress" makes it an easy and effective way for our club to communicate internally...while simultaneously reaching out to the world. Moreover, the website was designed to make it easy for PPRC leaders to contribute their own news about the areas they lead. Take a look at how the social justice committee has taken a lead on posting information. I tip my hat to Sid, for countless hours of design effort, and Tara, who immediately jumped in when the project was reaching completion. I "take my leave" as committee chair and am passing the baton to Tara. Watch as the communications outreach--already far surpassing the effort of most clubs our size--moves even further forward. 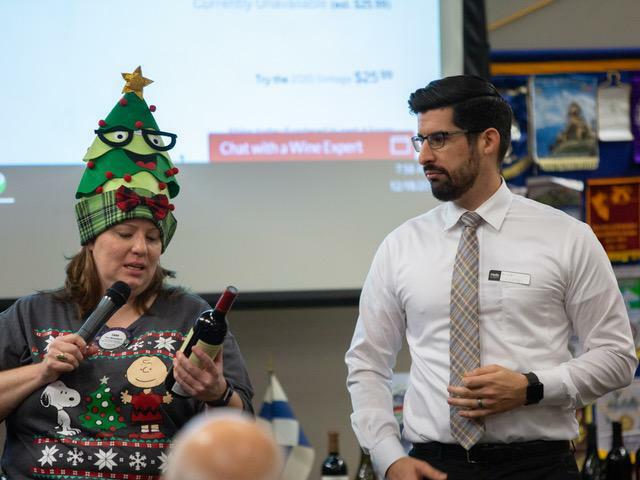 As we wrap up the calendar year and start looking toward 2019 and the tradition of New Year's resolutions, we're halfway through our Rotary year. I looked back at my new Rotary Year resolutions from July and am pleased with my progress but know there is more to do…always! Improve my leadership skills, sharpen the leadership saw, read, reach out to mentors. WIP (work in progress). Be healthy. When you’re healthy, you’re better able to serve others. I ’ll give myself a C and say WIP. Do the unsexy but important foundational/organizational work to set up the presidents that will follow. Build on and improve our already awesome organization and its systems and processes. Paul and I continue to work on this. 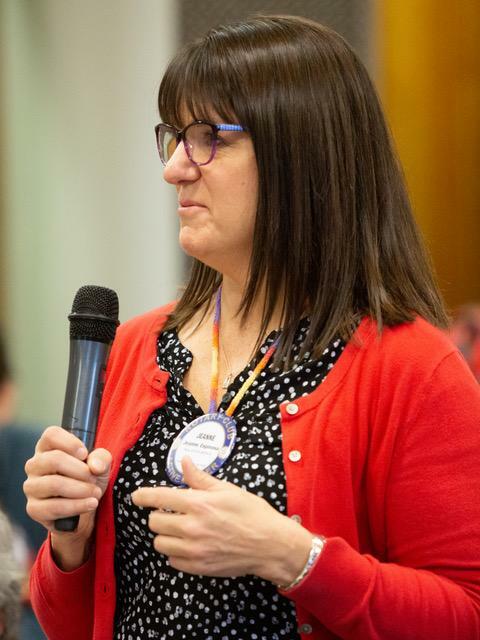 You can help by mentoring someone in the club on what you do and having a transition plan for when you move on to a different Rotary job. 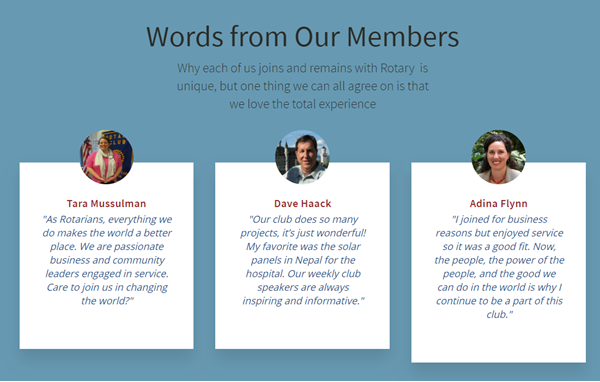 Engage every Rotarian in our club in a meaningful way. It turns out, not everyone has the capacity to be fully engaged. But Rotary is here when you’re ready! Ask yourself if you have the capacity to be more engaged and if you don’t know how let me know. 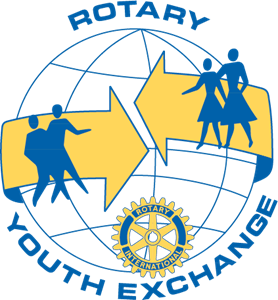 RFE (Rotary Friendship Exchange) with rural Oregon Rotary Club. I’ll get on this in January. What were your Rotary New Year Resolutions? How are you progressing? How can I help you with yours? 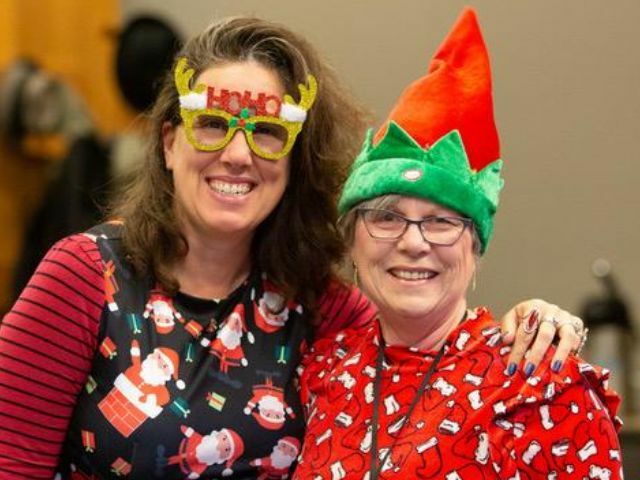 If you don’t have a 2019 Calendar Year Resolution yet, consider making it to become a Paul Harris Fellow or help someone else to become one. Or engage deeper with Portland Pearl, we need chairs for youth service currently and July 1 we will need chairs for club service, community service and vocational. Committee members are needed for vocational, youth service and international. 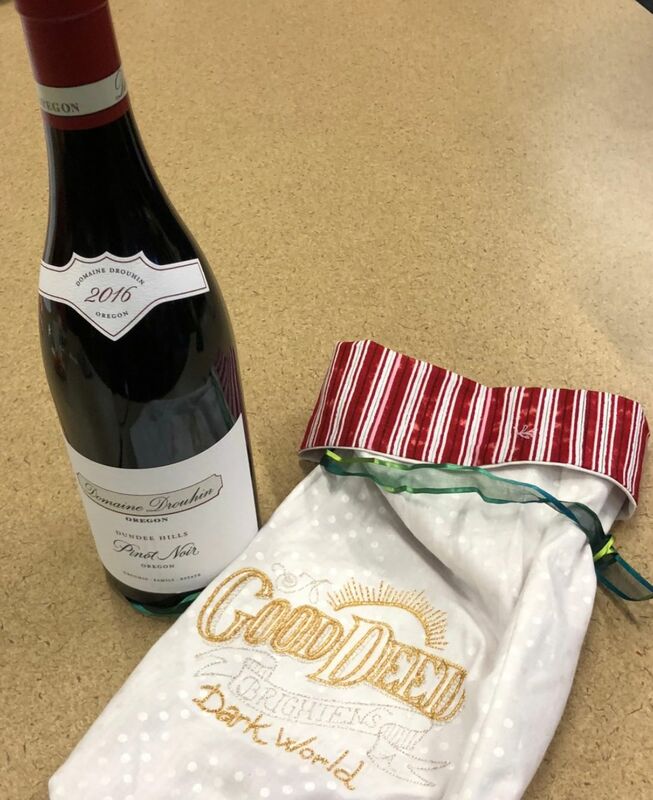 Let’s celebrate our successes in 2018! Happy new year! Life is odd. A year ago, I was knee deep in graduate school and at a job that I was not happy. This year, I graduated, quit my job started a company and I’ve reclaimed my zeal for life. Today, I feel overwhelmed, excited, anxious and exhilarated--often all at the same time. What I feel the most these days is gratitude. I’m grateful for my friendships, marriage and community. With that gratitude, I am reminded of the immense amount of privilege I have just by being born a white male. 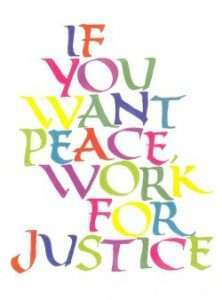 I try hard to be in action as an ally and accomplice in the fight against social injustice. I’m incredibly grateful to be serving as your president-elect. 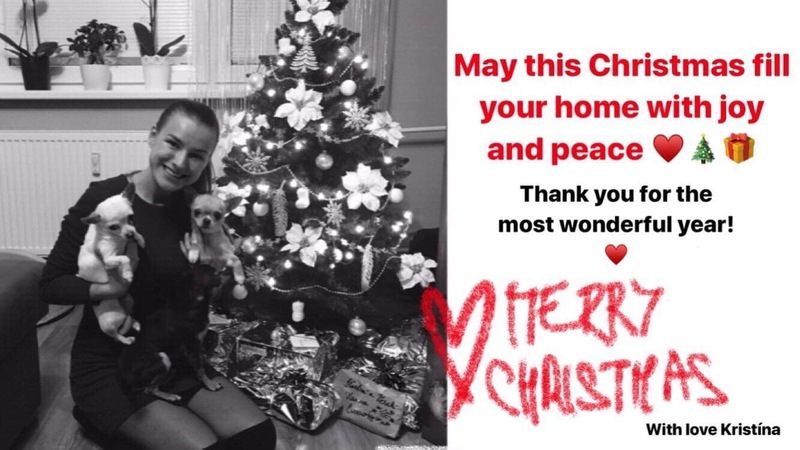 Thank you and Happy Holidays to you all! 1. I have been a Rotarian since 2009. 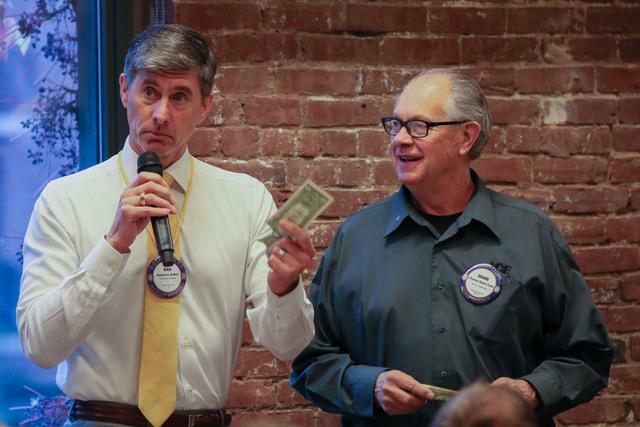 My friend Michael Carrick, a Rotarian and past president of Salem downtown Rotary Club introduced me to Rotary. 2. Rotary means a lot to me. 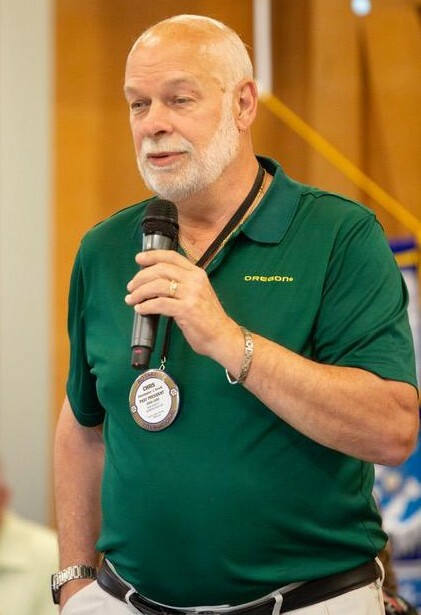 Before I became a Rotarian myself, I had attended a number of Rotary meetings as a guest and had hosted many visiting Rotarians in Russia and Ukraine. 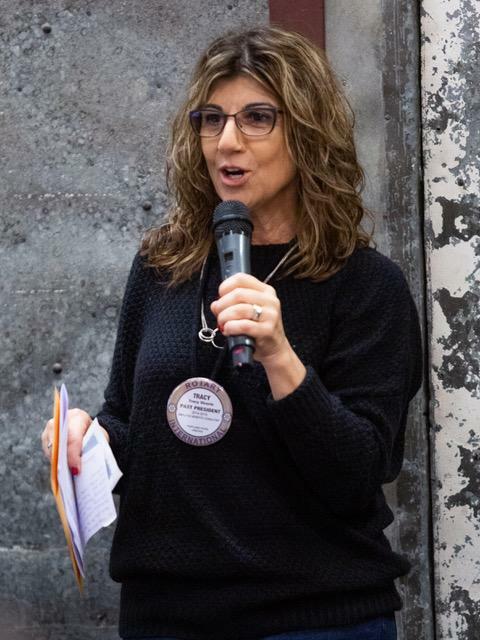 The concept of Rotary, as an organization of business professionals that provides humanitarian service and encourages high ethical standards in all vocations, is very important to me. Being a part of such an organization with such great projects all over the world is a real honor. I felt it especially when I visited the Rotary International convention in San Paolo, Brazil, in 2015. 3. I have been a language instructor at a private language school, DALY Communications," since 2002. The school renders professional services in teaching Russian and English as a second language. Most of my family members reside in Ukraine and the Crimea. 4. I love traveling very much! I was the one who organized two semi-official Rotary friendship exchange trips between Salem, Oregon (USA) and Simferopol (Crimea, Ukraine) Rotary clubs in 2008. I would like to take this opportunity to go into more detail on the Nicaragua Global Grant project we are pursuing. We have taken the first big step forward in the process by submitting a grant outline to the district for their review. The objective of this project is to provide 150 families (675 people) in Wisisi, a small village in rural Nicaragua, with access to improved sanitation for the first time. 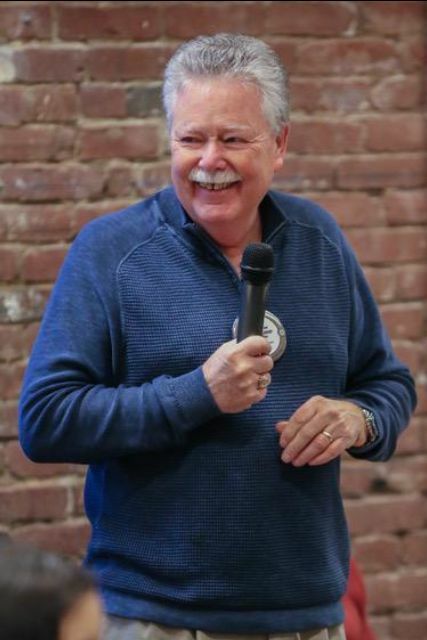 We will be partnering with the Matagalpa Rotary Club in Nicaragua and with Green Empowerment (GE), a Portland, OR-based 501(c)(3) organization. 100% of the households in the community already have access to safe water as a result of a project implemented in 2014, which involved the installation of a gravity-fed potable water system. The current project complements the previous initiative to further improve the health, sustainability and resilience of the community of Wisisi. In the coming weeks, we will be completing a draft of the grant for the project and starting to approach other clubs for funding. Portland Rotaractors have been volunteering their time this past fall every Monday with Braking Cycles and its transitional youth program. Rotaract has been providing help to youth on the street with dinner, clothing and basic necessities for survival. Braking Cycles, located on S.E. Powell, is a coffee bar and bicycle repair shop. Braking Cycles is committed to offering hope and tangible services that will provide youth and a place and opportunity to dream, reach and achieve. 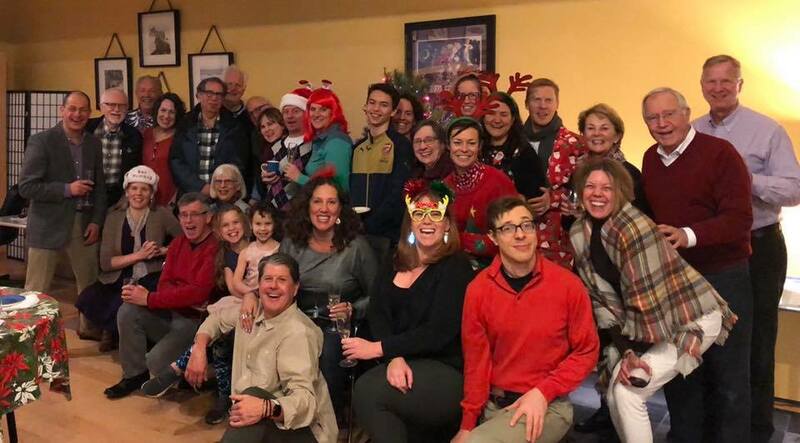 Rotaractors like Rotarians love to get together and celebrate the holidays. 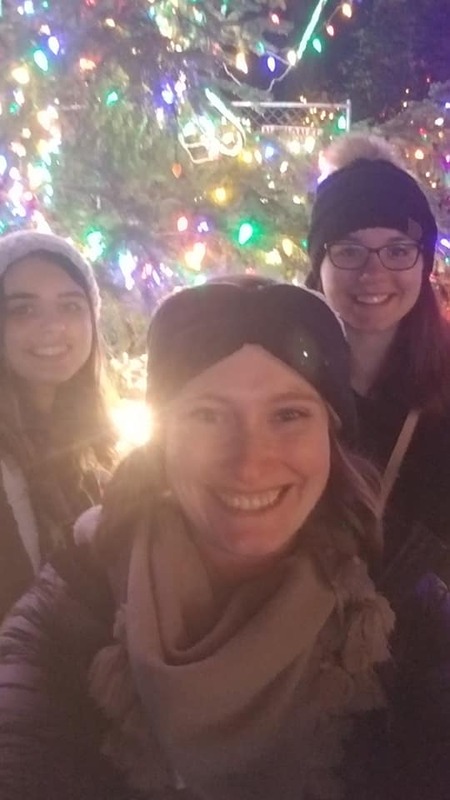 They have recently shared in a Friendsgiving and Christmas lights at the Grotto! What fun. 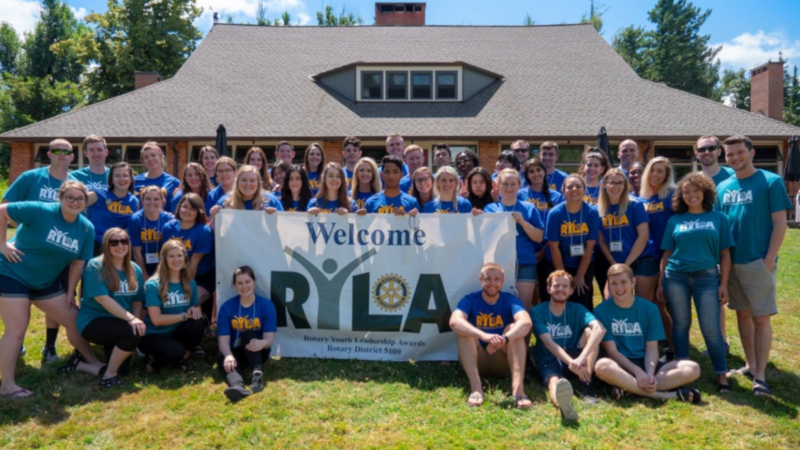 Looking for young professionals from ages 19-28 to participate in the 2019 RYLA experience. This is such an amazingly wonderful opportunity for college students and young professionals just starting out in their career. A week-long opportunity to develop leadership skills, plan the next 5-10 years of their lives, and be a part of a cohort that is dynamic, supportive and our future community and business leaders. The Club service committee helped organize this year's Holiday First Wednesday, hosted by President Adina Flynn. 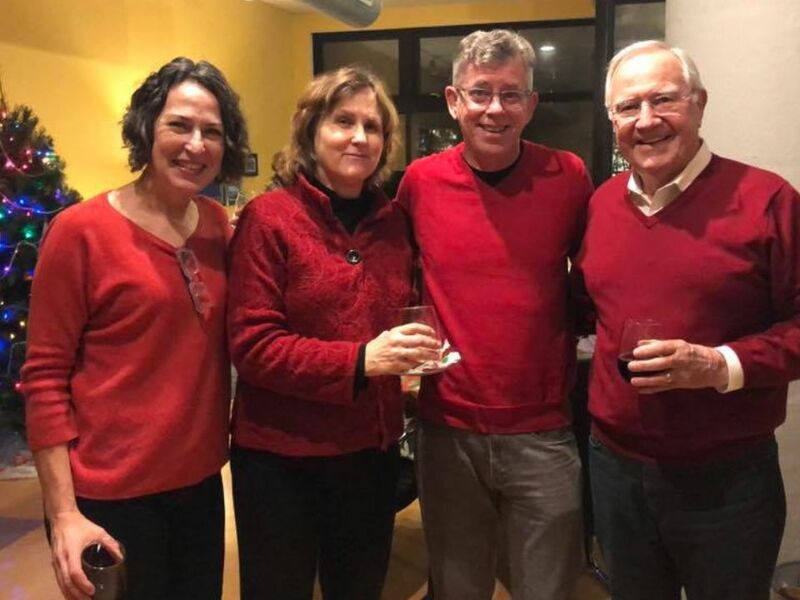 It was a fun, festive, scrumptious affair which was enjoyed by many club members and their guests. 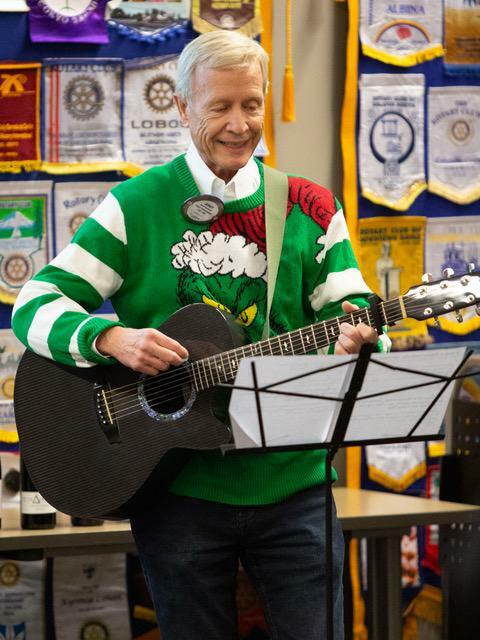 Members were also able to bring contributions for New Avenues for Youth, in concert with the Community service committee's clothing drive. Due to the New Year's holiday, First Wednesday in January will be held on Jan. 9, 2019, instead of the regular date, which falls on Jan. 2 next year. Community service has been busy meeting our obligations to both Meals on Wheels and Transition Project. Additionally, the club supported our efforts to collect clothing for our partner, New Avenues for Youth. 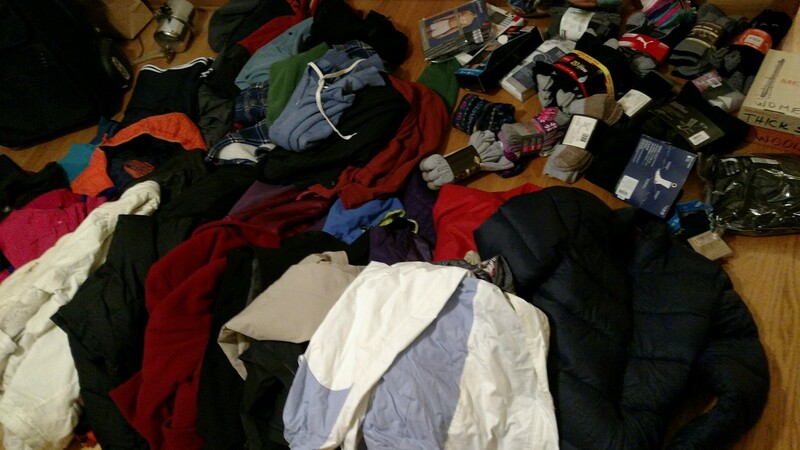 Alan Bacharach reported that as of Dec. 4, we had the following: 10 dozen pair of socks, 18 jackets, 15 sweatshirts, 10 hats, a dozen sets of new underwear and a large bag of toiletries. Thanks to Alan for his hard work in collecting and delivering these much-needed items. Michael Steen has submitted a request for matching funds from the district to support our next Street Roots appreciation barbeque. We will begin working on the details in the New Year. oe Taylor will once again be the captain of this effort. The committee will complete the dictionary project in the New Year. Although Bill Dolan has stepped away from the club, he has volunteered to complete this project in January. The committee is going to evaluate the worthiness of this project once we complete the 2019 version. We would welcome one or two members to our group. Please talk to Jonelle if you are interested. 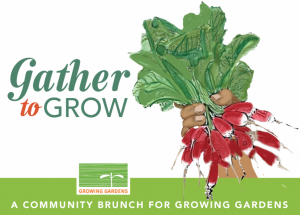 Jan. 20--Jerry Baysinger and Randy Vogt team up to present a smorgasbord of plant-based delicacies to try while you’re watching football in Randy’s condo in the Irving Street Lofts. Feb. 24--Seth Gardner will host an Oscars night extravaganza! Invite your friends and come vote on your favorite movies of 2018. May 4--Lori Beight will host a Kentucky Derby viewing party! Since the horse racing track is closing this year, we’re in search of a fun venue to host the party so more people can attend. 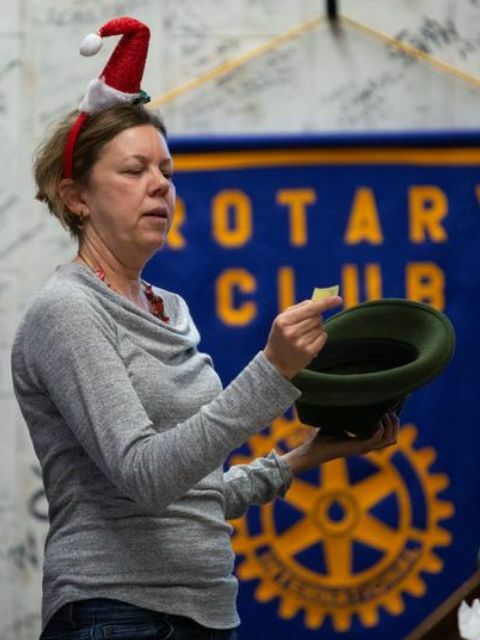 If you have ideas, track Lori down at a Rotary meeting and let her know what you suggest! 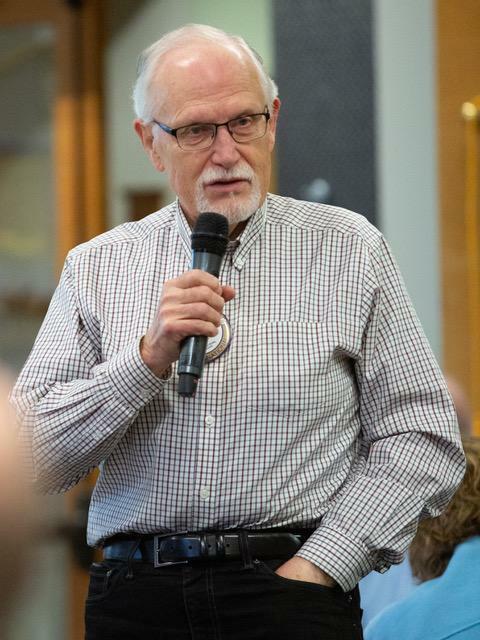 July 22--Pat Mahoney has tentatively scheduled the 2019 Golf Tournament, co-sponsored by the New Generations Club. Come golf and laugh with friends at Langdon Farms. You too could sponsor a fundraiser! Find a friend and co-host an event. All you need is a fun idea of a way to spend time together and a venue that will host enough people to bring a guest or two. Get a group of friends together and brainstorm--could you put together a getaway package to raffle? Or a fun sign-up party? Do you have access to a cool location most people would love to see but can’t get to? Do you have a special skill you could share? We’d love to hear your ideas! 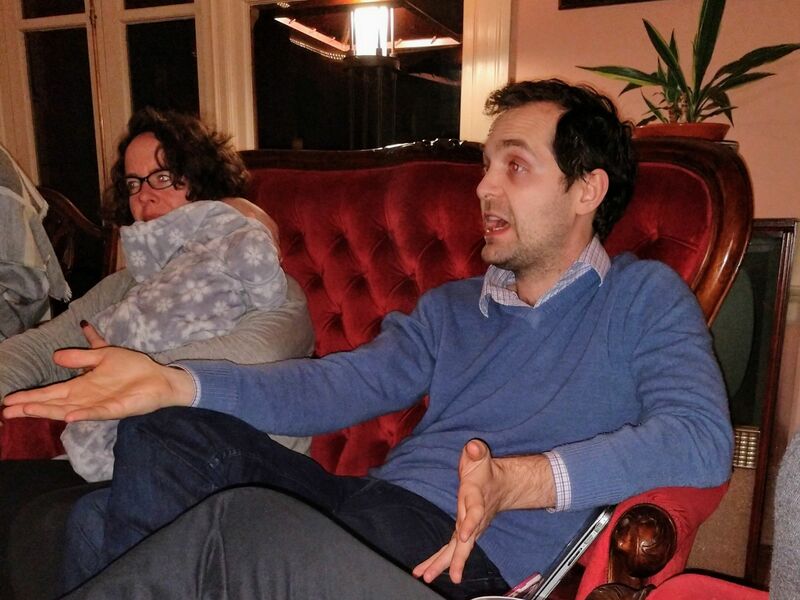 The Social Justice Committee (SJC) introduced a new concept to the Club at a recent meeting. Magna Carta, the newly available lending library book cart, was assembled on a Sunday morning. Mike Steen, Adam Steckel and Nancy Fowler labored to get the cart assembled. Members may now donate a book with a social justice theme and just as easily borrow one. Both novels and non-fiction are welcome donations. The cart will be available for browsing prior to each regular meeting. 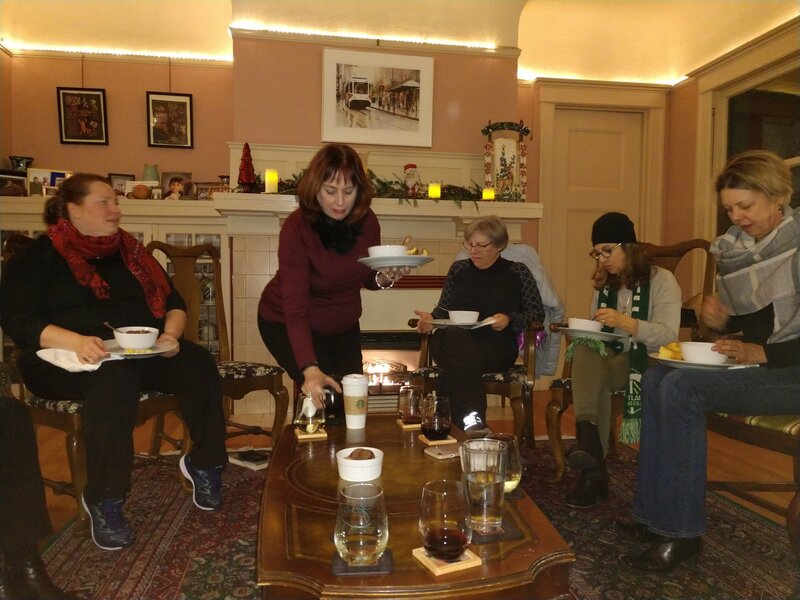 SJC's book club had a festive meeting at Kelly Morrow’s home Dec. 10. The book discussion centered around A Line Becomes a River by Francisco Cantu. 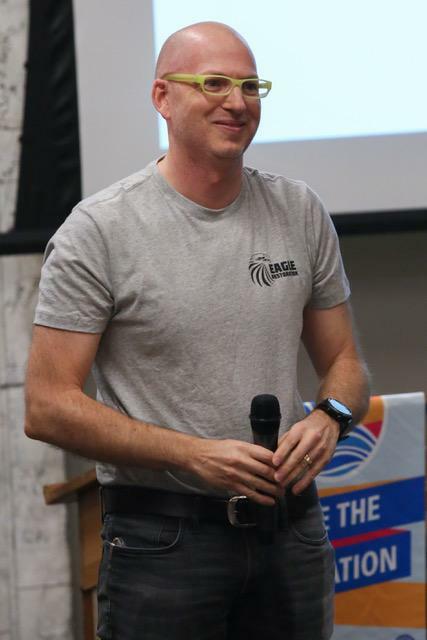 The conversation was facilitated by Rotarian Adam Creighton (pictured). About 15 members took advantage of this opportunity for sharing intellectual stimulation, good food and fellowship (see second picture!). The next selection is Less by Andrew Greer. This Pulitzer Prize-winning novel is both poignant and hilarious. Please join us for our next meeting in March (date to be determined). The SJC plans to have a presence at the annual District 5100 Training Conference on April 13. We are working on putting together a training on the necessary ingredients for setting up a social justice committee in other clubs. The SJC is in process to form a relationship with the AVID program. Advancement Via Individual Determination is a non-profit that changes lives by helping schools shift to a more equitable, student-centered approach. They train 70,000 educators annually to close the opportunity gap, so they can prepare all students for college, careers, and life. Key leader on this project is club member Adam Steckel. 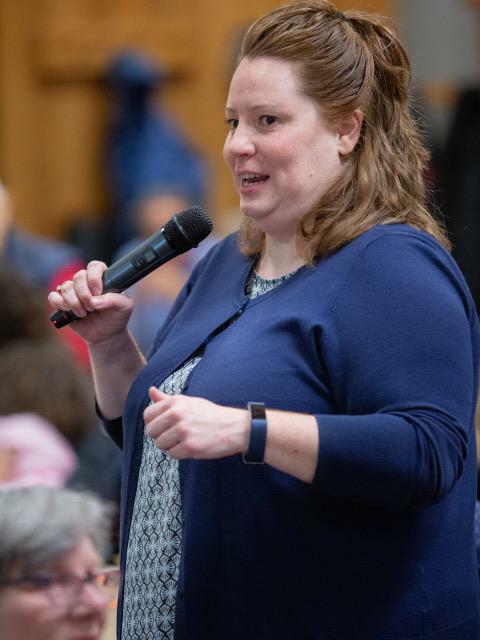 The SJC has made a proposal to the board to explore expanding the Student of the Month program (in addition to Lincoln HS) to a school with a different demographic student population and the board has approved the idea in concept. 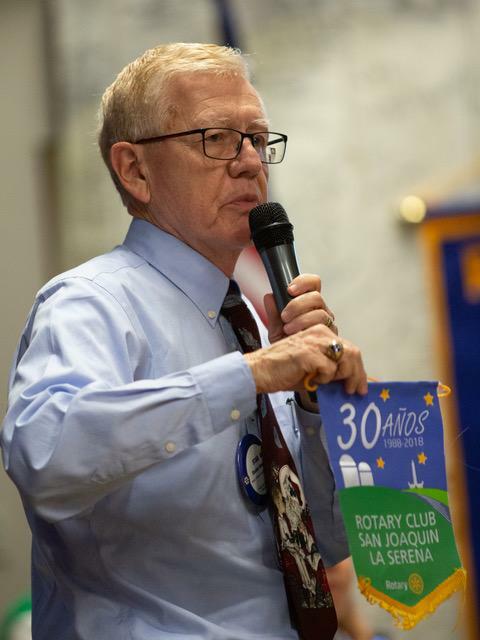 The feasibility of this project is currently being tested, and if we can work out the details, we will point toward implementation in the 2019-2020 Rotary year. We are pleased to announce a new membership application, which was just received Dec. 18, from Nick Fandel, who is a relationship manager at First Republic Bank. Thanks to Joe Taylor who invited Nick as a guest! 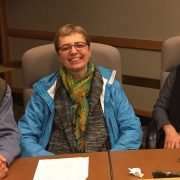 • Molly Nissen, who has attended several club meetings in the recent past. We are following up with both of them, and we hope to welcome them into PPRC in early 2019. 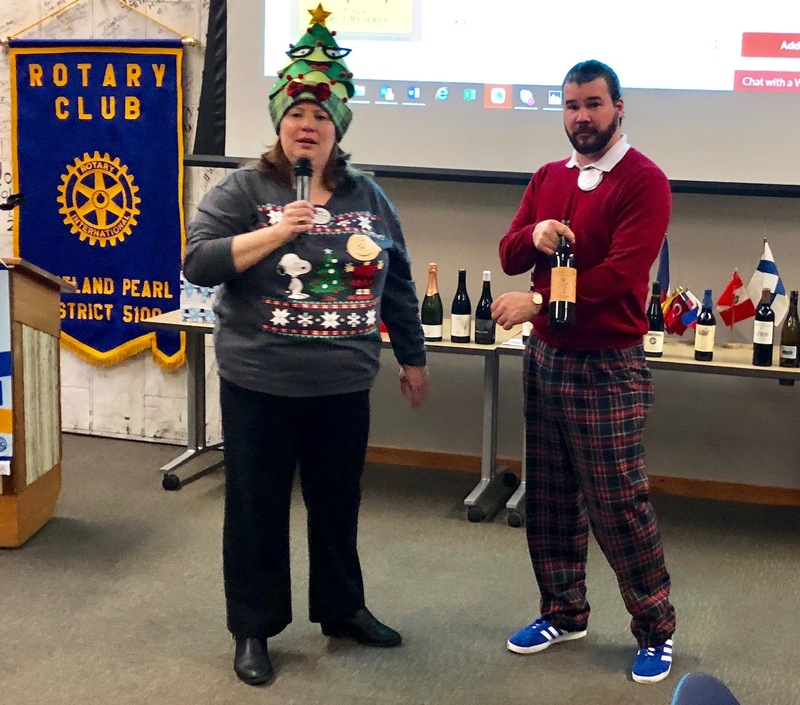 In other news, Adam Steckel was recognized at the club meeting on Dec. 11 for successfully completed his red badge tasks. Congrats, Adam! 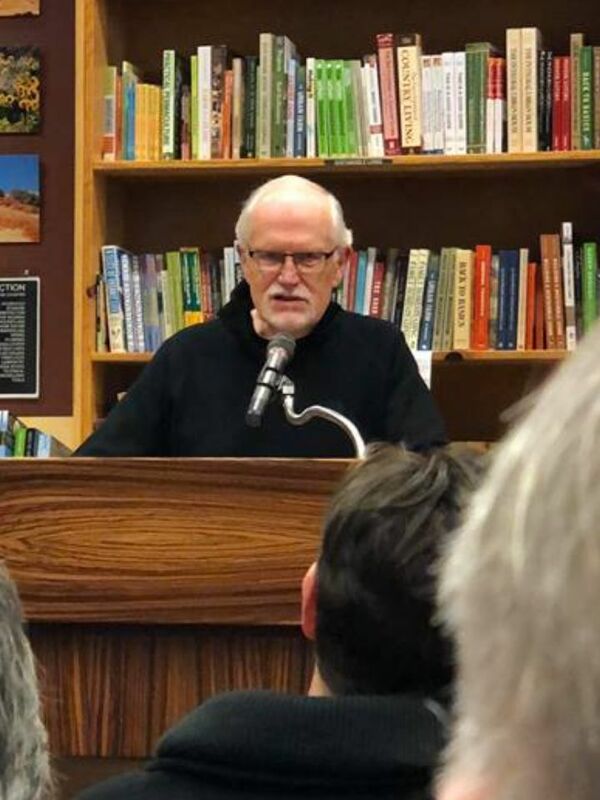 • Two images here: George Wright, author and past president of PPRC, sharing his process of writing and how his latest novel, "I Am Ned Pine," came to be and what it's about at Powell's Books, Cedar Hills Crossing, Dec. 6. 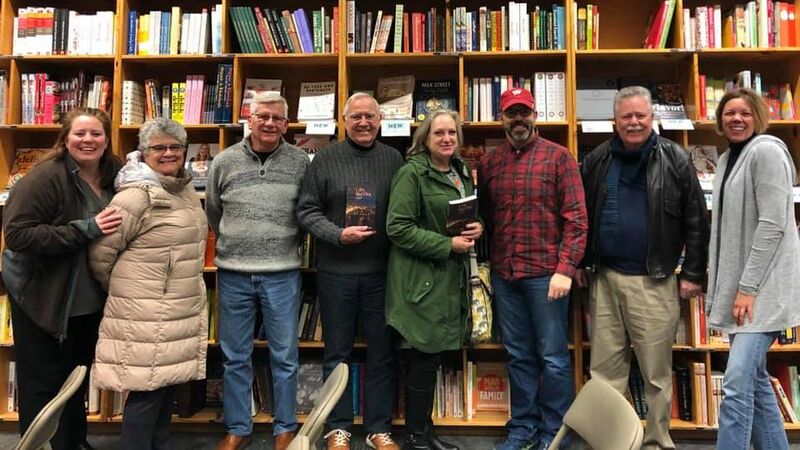 Second picture: Pearl Rotarians supporting our favorite local writer. 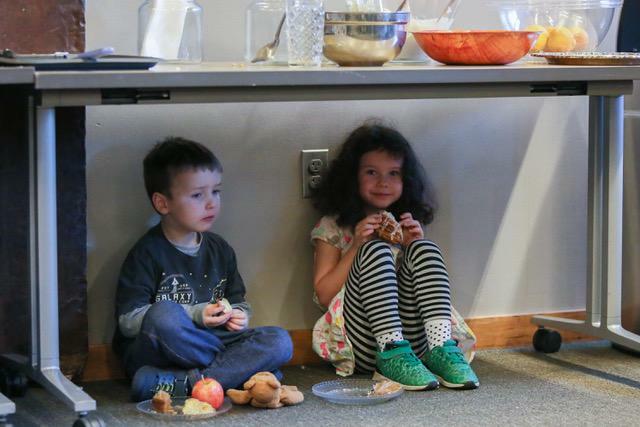 • Cousins--Clark Hendrickson, age 4, and Teagan Cronin, age 5--enjoyed a private breakfast picnic at the Nov. 27 PPRC morning meeting; they are the children of Rotarians (and twins) Alanna Miel and Darcy Rose. 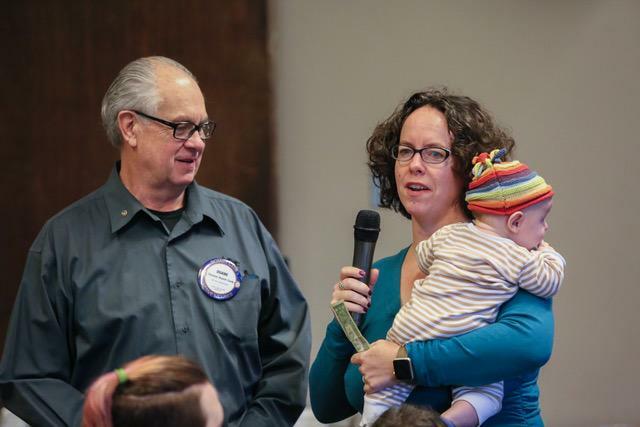 Also in the image captured by Rotarian Seth Gardner is “Bear,” who just returned from three weeks in Uganda (with Miel and her infant son, Ellis). 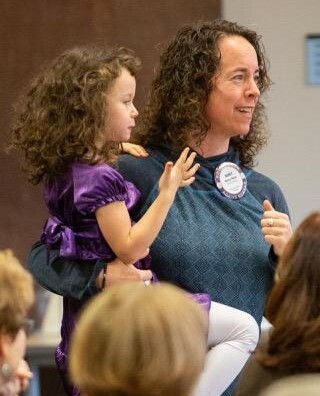 Added Darcy: "Rotarian Diane Brandsma was happy to share with me that she watched Teagan fill up water glasses for them and then they clinked their glasses to cheers. Too cute!" 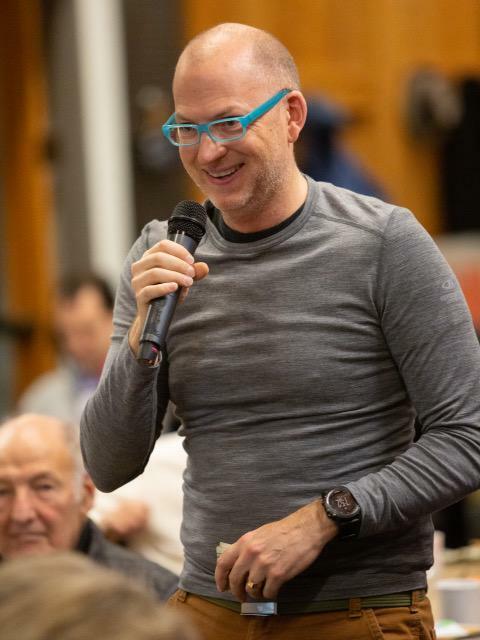 • Paul Thompson, PPRC president-elect, announced at the Nov. 27 meeting: "After 17 years with ServiceMaster, I decided to start my own water restoration company. We can handle any water loss in homes or businesses and specialize in the drying and demolition phase of the project. I have two amazing and supportive partners with Andy and Kari Sherman. The three of us have worked together previously. Andy and I worked together for over 15 years. Between us, we have over 40 years of experience in the industry. 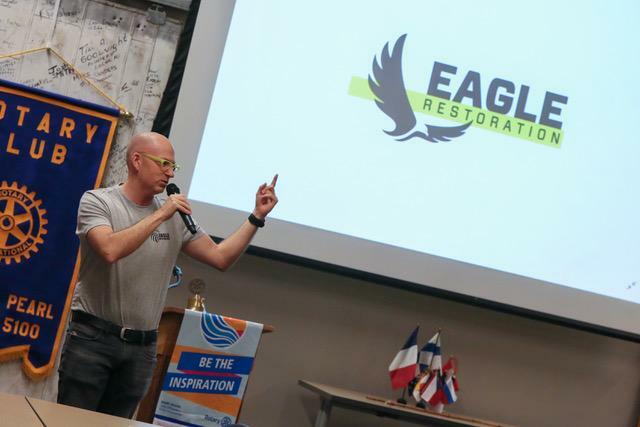 I am incredibly proud to introduce Eagle Restoration!" • Was it fun (No. 1)? Successful? Good for a cause? The answer is yes, yes, yes. 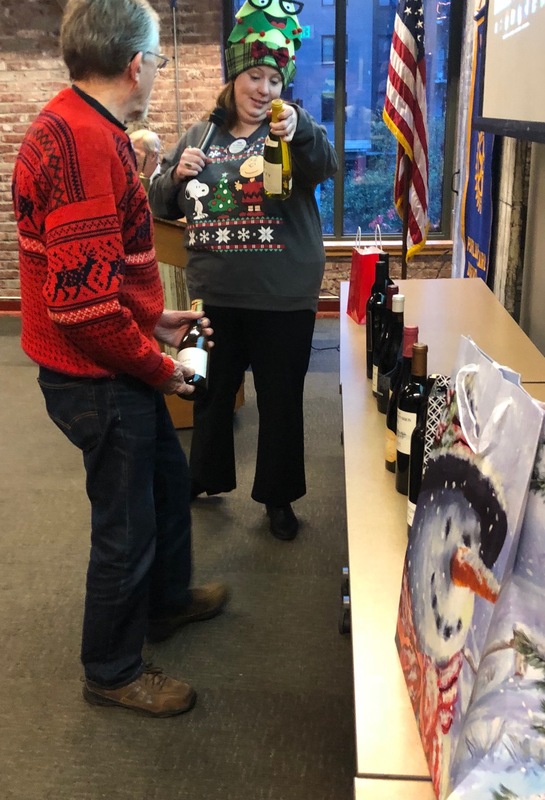 Pearl Rotarians gathered Dec. 5 at President Adina's Ameriprise office for the annual holiday party. 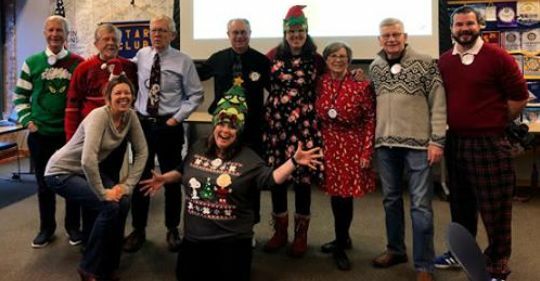 Smiles on the faces tell the fellowship story of Rotarians, significant others (that's Adina's father in the Hawaiian shirt) and guests (as do the costumes worn by some). The party also saw participants bringing winter clothing for the New Avenues for Youth collection (see community service report above). • Was it fun (No. 2)? Interesting wine offerings (from Oregon to Europe)...a raft of "steals" by Rotarians from fellow members...bottles ranging from a 2000 Willakenzie pinot noir to recent Willamette Valley vintages...the resurrection of banter from previous events between Past Presidents Lou Radja and Don Smith (Lou laid down the gauntlet with a $50 payment and urged others to steal Don's choices at $10 per)--the Dec. 18 annual wine exchange was all of that--plus plenty of laughter. And in the process, Rotarians raised $405 for the Pearl Fund. 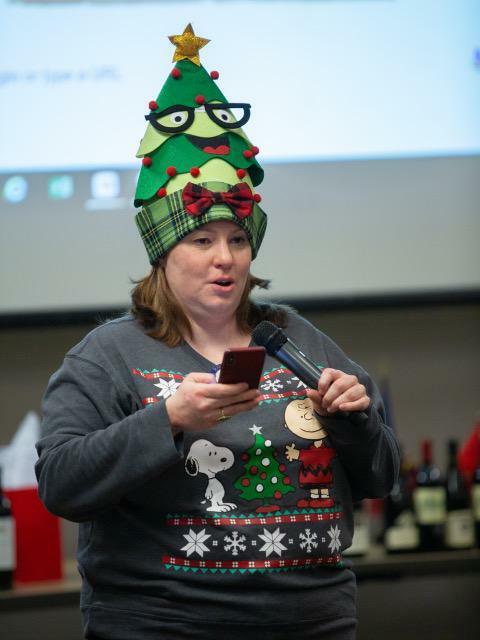 Past President Tara Mussulman exhorted: "You can steal! You can steal!...Remember stealing is caring: It's a good cause for all the good deeds we do." 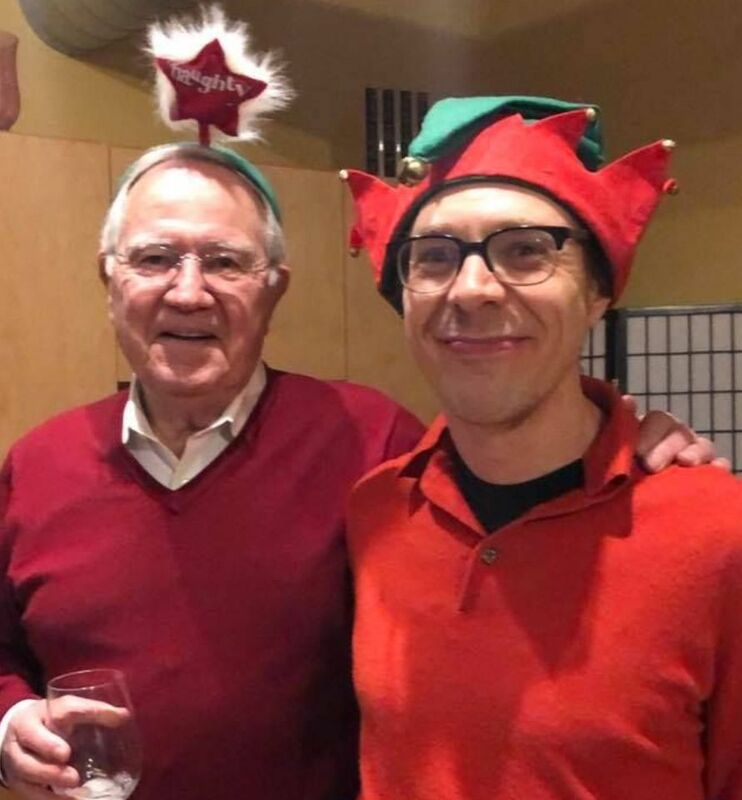 The meeting ended with a photo of members who came in Christmas garb. "Some relationships change you forever. When we hosted Kristina two years ago, we had no idea that we would be gaining a daughter and now know two men named Igor and Boris! The world is a small, beautiful, amazing place. "Kristina grew up in Slovakia but lives in the Czech Republic where she is attending college. 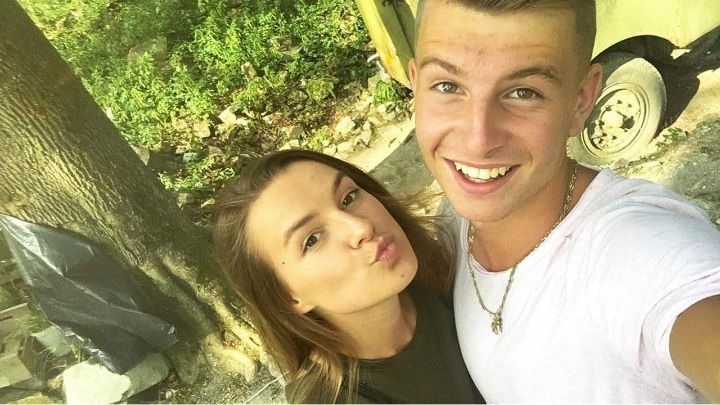 She lives with her boyfriend Boris, which is a big change from our sweet high schooler with no boyfriend! Her Dad Igor told me, “She’s in LOVE!” Boris is a good-looking young man with a ready smile. "Kristina works two jobs to afford college and her apartment. In May she is taking entrance exams to try for the second time to get into a medical school. She’d like to study physiotherapy and Chinese medicine. She’s in a program studying biophysics now." Meet Otis Kohnstamm, Lincoln H.S. - Plans for the future...education, career: Currently applying for undergraduate admission to universities across the country; look to pursue some sort of career in digital media. - What drives you to succeed? I try to set my goals as high as possible and match them with a work ethic necessary to reaching them. - What would be one area of our community you would like to see improvement? Bridging the social gap between disabled people and abled people. 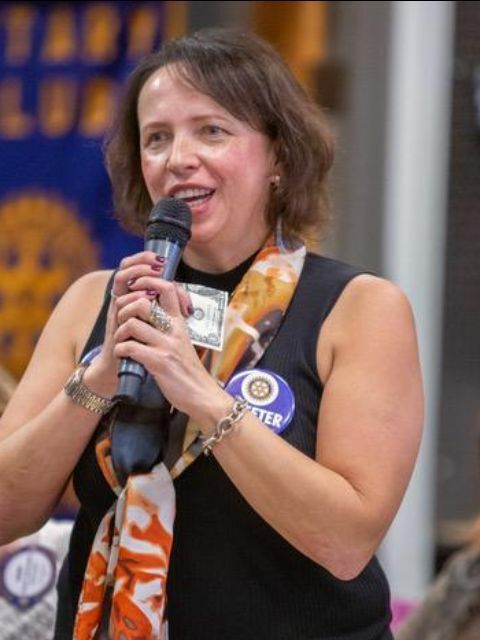 Who is the former Pearl Rotarian who was on the Multnomah County ballot this month and what office did this person move from and become elected to? 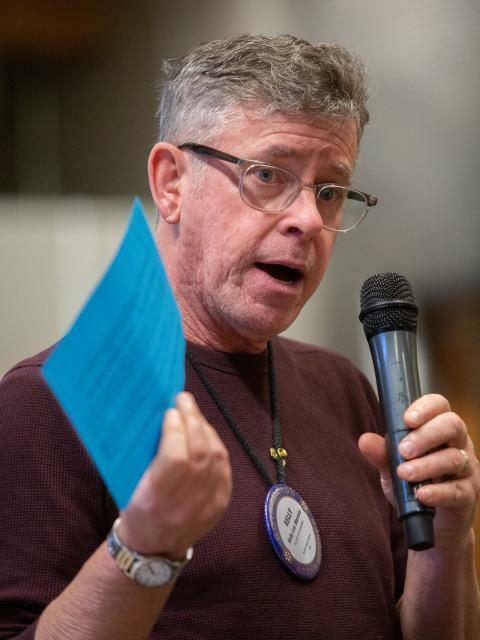 For the Puzzler's farewell challenge, answer this: What insertion in the news sections of the December 2018 Rotarian Magazine was directly connected to Pearl Rotary? Answer via email to donaldqsmith@yahoo.com to claim your $5 coffee certificate (if you're first with the correct response). 12/4 “My friend told me he doesn’t understand what cloning is. I told him that makes two of us.”--???? Taiwan, along with Rim countries such as South Korea, Singapore, and Thailand, is one of the so-called “Asian Tigers," places where standards of living have improved rapidly, average educational attainment has experienced dramatic increases, and the movement to cities has become a major demographic development. 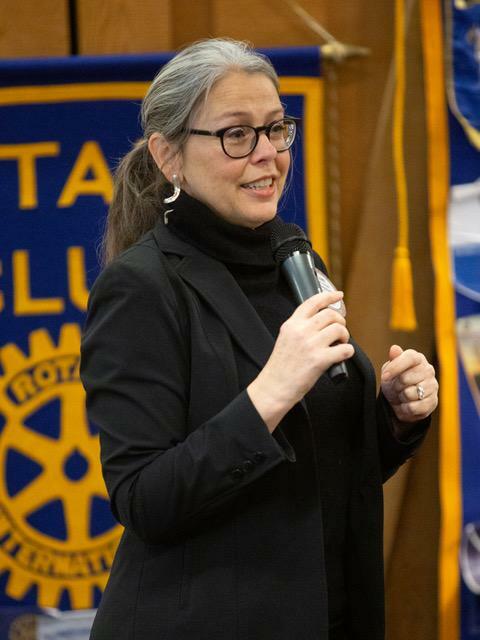 While Asian Tigers such as Taiwan have evolved rapidly in character toward the developed economies of the Western world, Zaidie told Rotarians that she experienced a “big transition” in her move from the culture of Portland to the culture of Taiwan. Much of Zaidie’s year may be followed by reading the blog she kept. The interesting, well-written document is available on the internet at https://myexchangeyearintaiwan.blogspot.tw. 1. The tendency of Taiwanese students to study very long hours, a pattern that limited her ability to interact informally with them. Some of the intensity of study reflected the fact that advancement in the educational system such as attending college was dependent on nationally distributed achievement tests. 2. The large size of the school she attended (over 2,000 enrollment) compared to the population size at Catlin Gable (about 300). In such a large Taiwanese school, Zaidie had relatively superficial acquaintances with many of the students. 3. The sometimes-unexciting classes she attended where the courses were based almost completely on lectures by the teachers, with little opportunity for human interaction or discussion. 4. The complexity of spoken language. 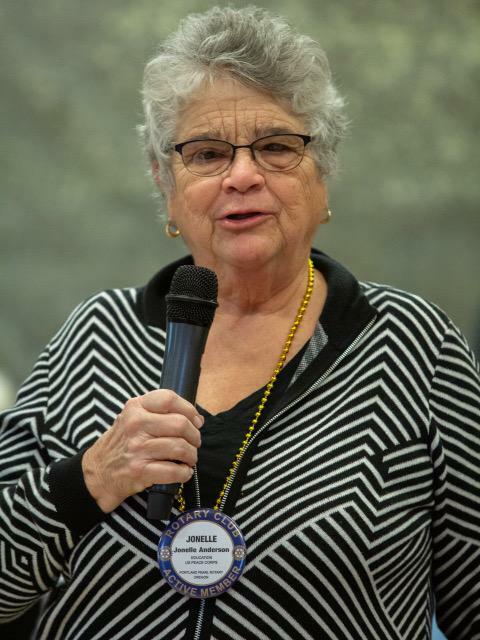 Zaidie knew some Chinese before leaving Portland but found that many Taiwanese spoke a separate language which had little relationship to the Mandarin Chinese that she knew. 5. The Chinese diet which was somewhat different than the basic American middle-class diet, as found perhaps at Applebees Restaurants. Zaidie found herself positively excited when she had the opportunity to eat the American way. 6. The busy, complex life in the Taiwanese cities. Zaidie speaks very positively in her blog about the excitement and happiness from visiting Taiwanese rural areas and places with scenic geography. While many of the Asian Tigers have had complex political histories, Zaidie’s found that Taiwan has had some unique experiences. In 1949, the Chinese communist movement drove the Chinese Nationalists off the mainland to the island of Taiwan. The Nationalists, with hopes of returning to the Chinese mainland, established Taiwan as their bastion, but their migration was not smooth sailing. Many Taiwanese, with a distinctive language, a separate social history, and a long experience with earlier Japanese occupation, did not necessarily identify with the mainland or the Nationalists. The result was an ambiguous relationship of the island to the mainland, with the international power of Taiwan declining as the mainland emerged as an important world force. Political conflict within the island often focused on the issue of whether Taiwan should achieve some rapprochement with the mainland communist government or should strive to achieve a highly independent path. 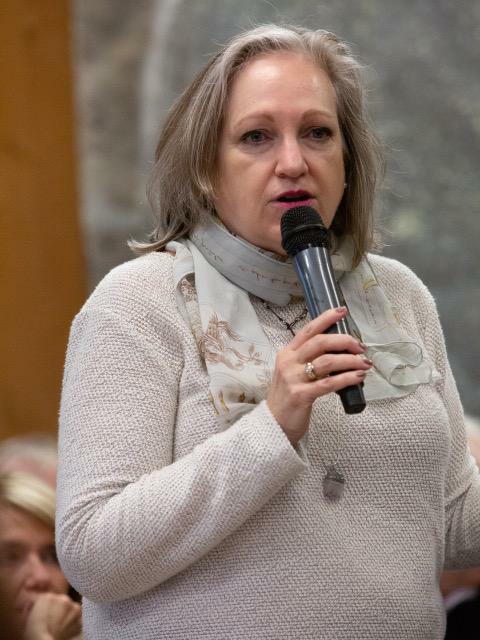 One example of the confused political situation was that high school students, including Zaidie, were required to take a class in shooting guns. While Zaidie does not explain directly the logic of this requirement, it probably results from a feeling of the island’s leadership that military prowess among students may become valuable if open conflict breaks out between the mainland and the island. Zaidie seems obviously happy to be back in Portland, but her experiences in the Asian rim have whetted her appetite for even more international experience. 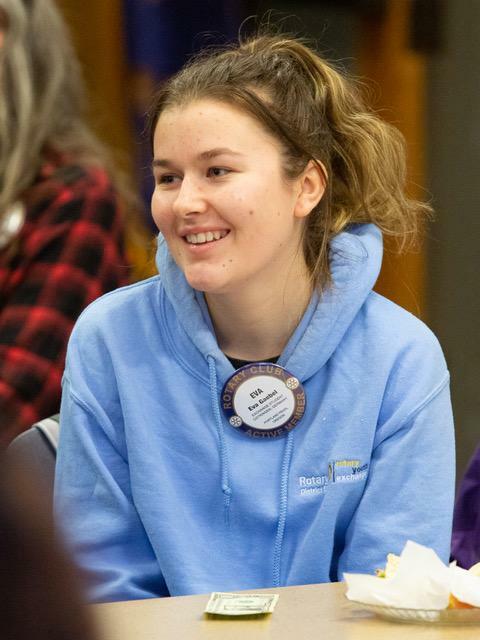 She told Rotarians that she would like to major in international relations in college but has not picked a specific school. Nevertheless, she indicated some specific interest in studying in France, a country that holds a strong attraction for her. Salmon is one of the distinctive features of Pacific Northwest cuisine. Many of us will feel our mouths water when we think of eating salmon dinners that have been freshly baked on hot coals. But times are not good for catching the salmon in our sea and freshwater habitats. A long-term decline in the size of the catch has occurred, and it has been particularly notable in the past year. The future of salmon harvesting is questionable. 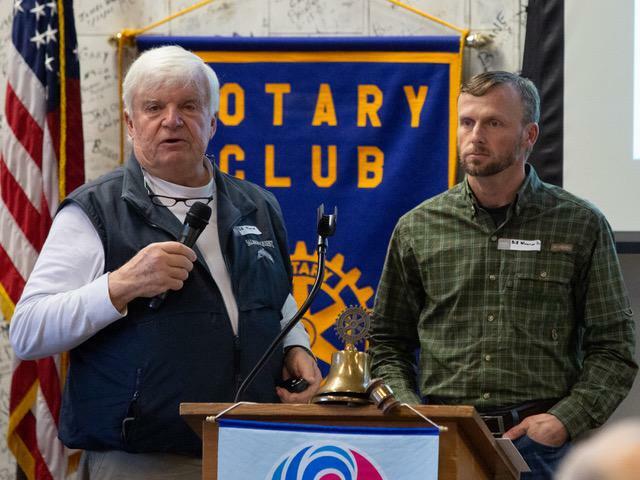 Two well-known Portland fishermen, a father and his son (both named Bill Monroe) , talked with Pearl Rotarians on Dec. 4 about some of the factors causing the salmon decline. 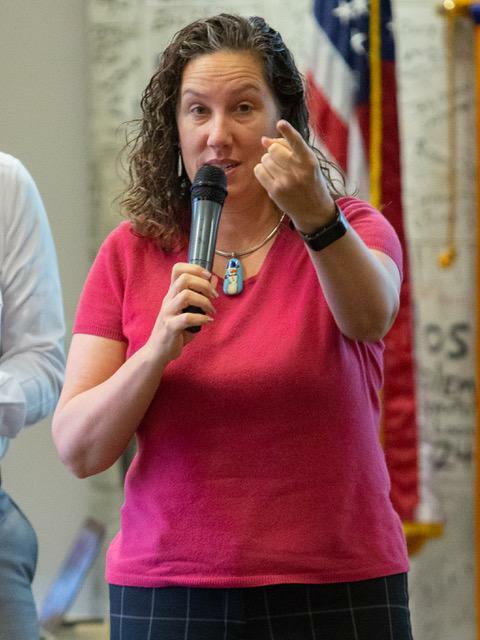 Their presentation could be viewed as a lecture on the nature of ecosystems since they emphasized the interrelationships on the Pacific Coast of humans, nonhuman animals, and the physical environment. Bill Sr. is an outdoors columnist for the Portland Oregonian; Bill Jr. is the owner of Bill Monroe Outdoors. 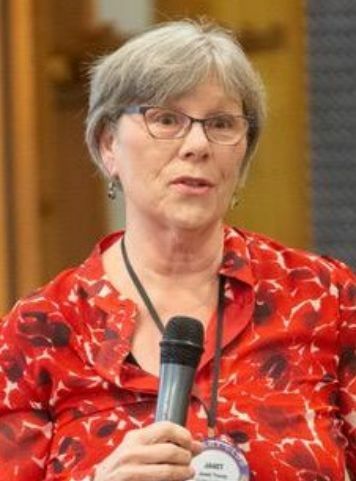 While admitting that much is unknown about the relationship of salmon numbers to the ecosystem in Oregon water, the two Bills focused on the fact that salmon numbers are heavily affected by the instinctive drive of salmon to return to spawn in the headwaters where they were born. The salmon struggle against the flow of water to the ocean, the elevation rise of the land in the coast interior, and the presence of physical obstacles to their movement. 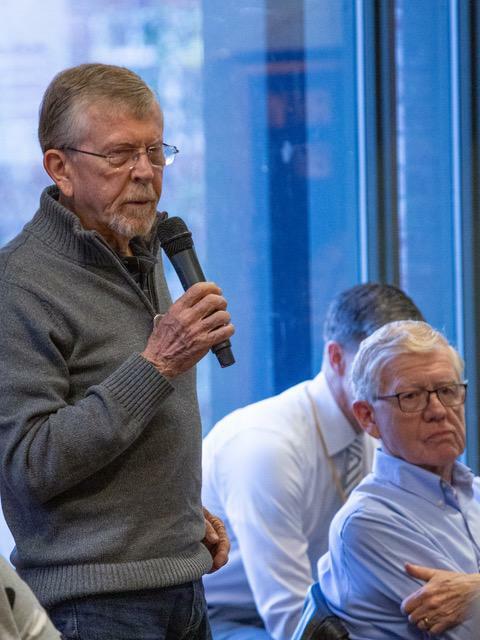 Bill and Bill especially emphasized the problem of salmon harvest as due to the growing numbers of sea lions who are eating salmon and other fish. Historically, the sea lions have concentrated in Pacific Ocean saltwater areas on the southern U.S. coastline, but literally hundreds of thousands have been moving north along the Pacific coast and into the freshwater areas of rivers such as the Columbia and Willamette. To satisfy their growing needs for food, the sea lions are allegedly eating the fish before they can get home to spawn. Indeed, some have speculated that the growth of the sea lion population has also affected the salmon supply and surviving numbers of the Orca whales who cluster around the San Juan Islands in declining numbers. 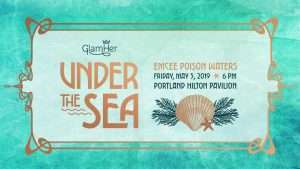 Many fishermen remember the “glory” days of their sport when abundant numbers of fish would be caught in major fresh-water rivers such as the Willamette, even in situations where the waterways passed through major cities such as Portland. But those days seem to be gone. 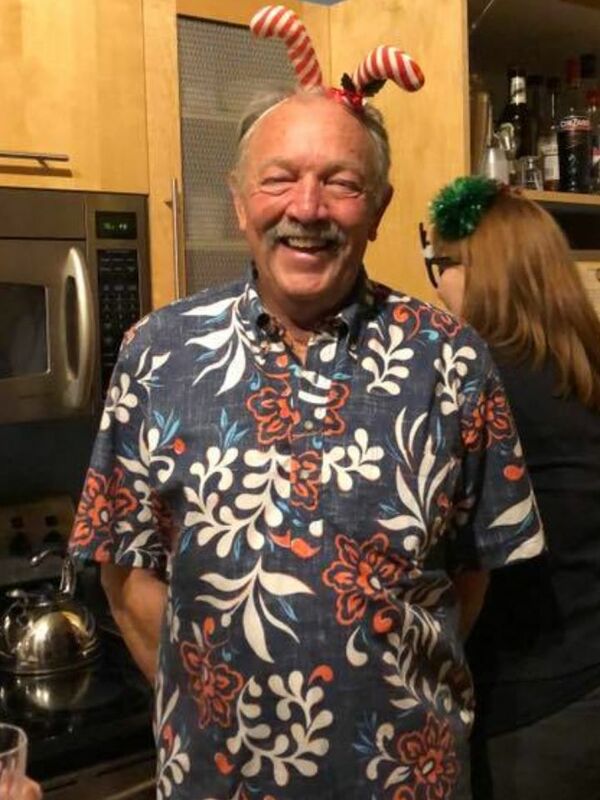 Bill Sr. described the fishing environment in Oregon as “doom and gloom” with many explanations being given for the current problems with the supply of salmon. 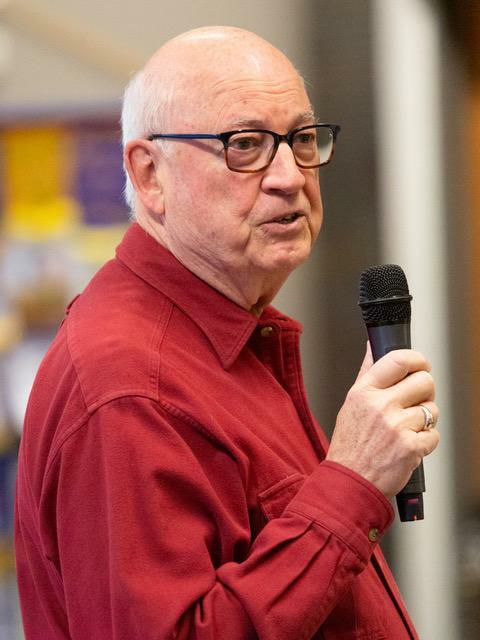 As he summarized, “Gnarly decisions face salmon managers.” But the Monroes did not project total pessimism about the future of local fishing. 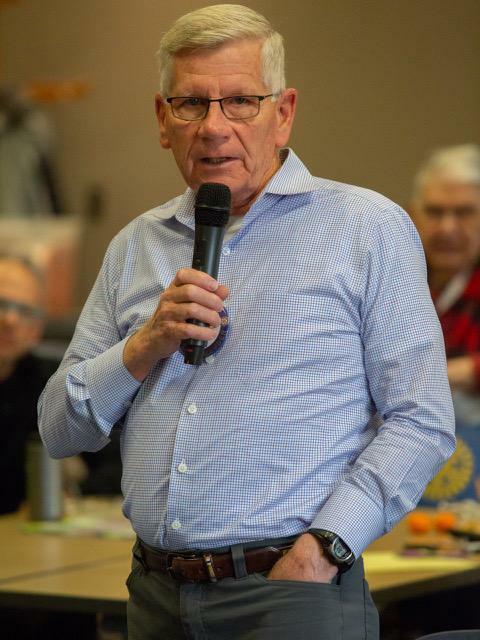 Following his pessimistic statements, Bill Sr. told Rotarians, “but there will be seasons," meaning that some supply of salmon would last into the near future. In the past, governments in the Pacific Northwest have mainly regulated the fishing industry by setting catch quotas during specific seasons. Separate quotas are maintained for Native Americans, due to treaty rights as established by negotiation. Sports fishermen also have individual rights, including quotas, that continue to guarantee their activity. The quota framework is likely to continue, but the supply of fish will significantly affect how the quotas are established in various years. In their talk, the Monroes seemed caught between two different perspectives on long-term intervention in the environment. On the one hand, they implied that some deregulation of government controls on fishing may be useful to help restore the balance of nature that encouraged high salmon production. On the other hand, they implied that increased government regulation of predators such as the sea lions may be useful to create a physical environment where the salmon may flourish. 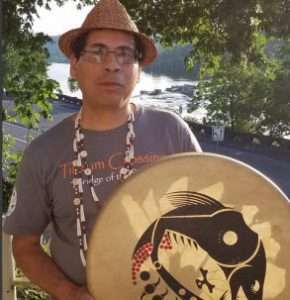 But underlying all their concerns was a belief that the government has responded mainly to social pressure exerted from organized interest groups such as environmentalists, rather than any serious workable plan to bring back the salmon in large numbers. Other explanations of salmon supply exist besides the growth of the sea lion population. Many of our freshwater dams have blocked the movement of fish up the ladder to their spawning grounds. The Pacific coastal waters increasingly carry boats and other watercraft that interfere with the activities of major water actors such as the whales and fish. While major efforts have been made to clean up polluted water in Oregon and Washington, the damages from years of poor use may have created unfriendly habits for the salmon. 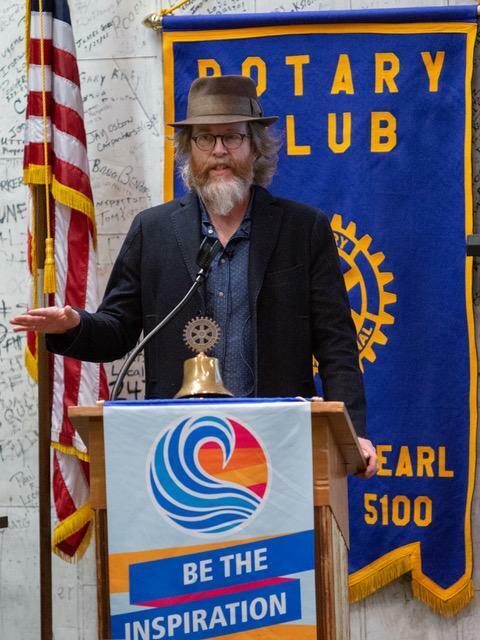 Darren Orange told Pearl Rotarians on Dec. 11 that he is a “speeded up” artist who works primarily with oils to paint the environment and nature. Why the speed in producing paintings that have won numerous awards? Darren says that speed in his “intuitive” painting lets him be unusually creative. As told to the Rotarians, Darren likes to start a painting by throwing different colors on the canvas in a somewhat abstract form. He then works intuitively with quick hand motion to revise and add to the painting (pigmentation, as he calls it). In some cases, the painting will end up in a fairly abstract form. In other cases, Darren sees (as he works) the potential of realistically describing specific examples of the natural environment. Much of his “concrete” or representational work focuses on the landscapes of Oregon and Washington coastal areas and the Northwest interiors to the east. The process ends when Darren feels that the painting makes a statement that is compatible with his interest and love of the natural environment. While Darren’s paintings may focus on specific examples of nature, they almost always contain some abstraction. No doubt, many art experts would see his mode of working as a bit offbeat. But Darren is a highly respected artist who lives in Astoria. L.C. Smith, an art collector, provides an articulate assessment of Darren’s work, “His treatment of environmental and human degradation – in paintings, collages, and bronzes – is defined by an unblinking fierceness. He is a relentless, driven and exacting observer of our age, of Nature, and of our impact on Nature. The resulting work is monumental, enduring and of outstanding significance." Darren has been obsessed with art and the natural environment ever since his childhood when he lived by an apple orchard in Central Washington. 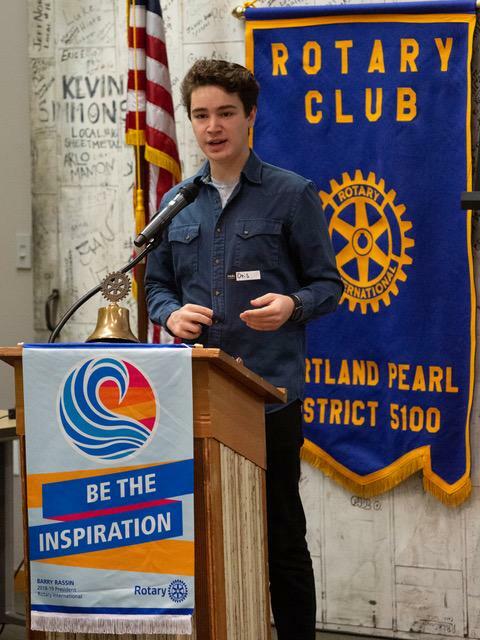 He told the Rotarians, “As a child, I liked to do things with my hands such as build forts. I was never bored. 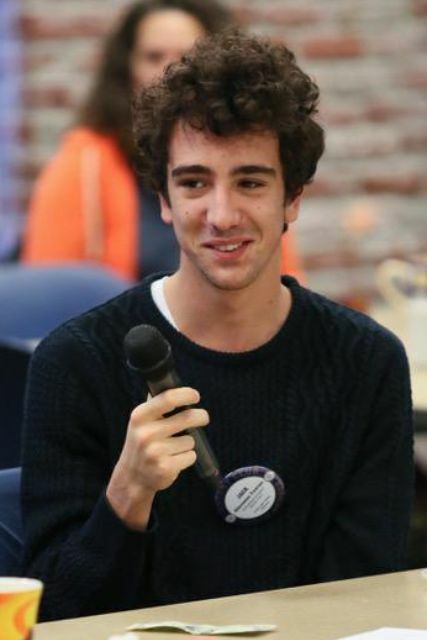 As high school came along I knew what I wanted to do--go experience things.” He attended Western Washington University. In 2000, he and some college friends moved to Astoria near the mouth of the Columbia River. Darren now works out of an Astoria shop, Homewrecker Studios. The quality of Darren’s art is indicated by the fact that he has exhibited at many galleries in the United States. 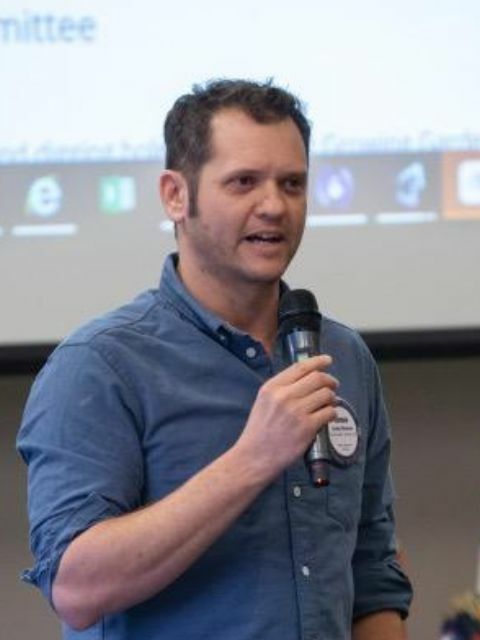 Darren has been awarded the Oregon Governor's Award for the year 2019. He will be presenting a solo exhibition in the governor's office in Salem, December 2019. Joan Pendergast Darcy Rose Jack (Italy), y.e. Come check out Rotaract — Rotary for Young Professionals. They have regular meetings and will discuss up-coming service projects, social/fun projects and more — We would love to see you there! 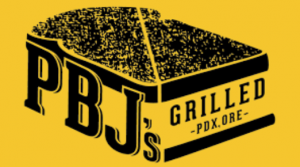 Enjoy a wonderful brunch and support one of Portland Pearl Rotary's strategic partners! 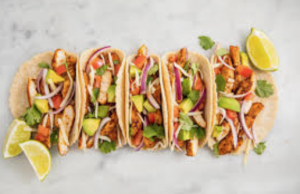 17 Tacos Party @ Adina's! Join us for vibrant, lively conversations. The Social Justice Committee is open to all Rotarians interested in helping to create a more just, equitable world for all concerned.